Hello friends! It's Karen Letchworth here with today's post. One thing we all have in common is that we all need LOTS of Birthday cards. That's another great thing about Really Reasonable Ribbon.....they have EVERYTHING you need to help you create the most lovely Birthday cards for all the special people in your life. 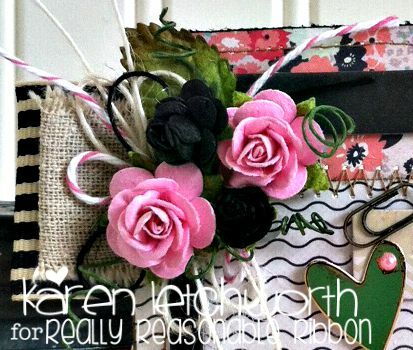 Here's one I made this week using some of Really Reasonable Ribbon's AWESOME supplies. I started with some patterned papers and chipboard, added my sentiments; and then I got down to the fun part - adding ribbons and flowers. 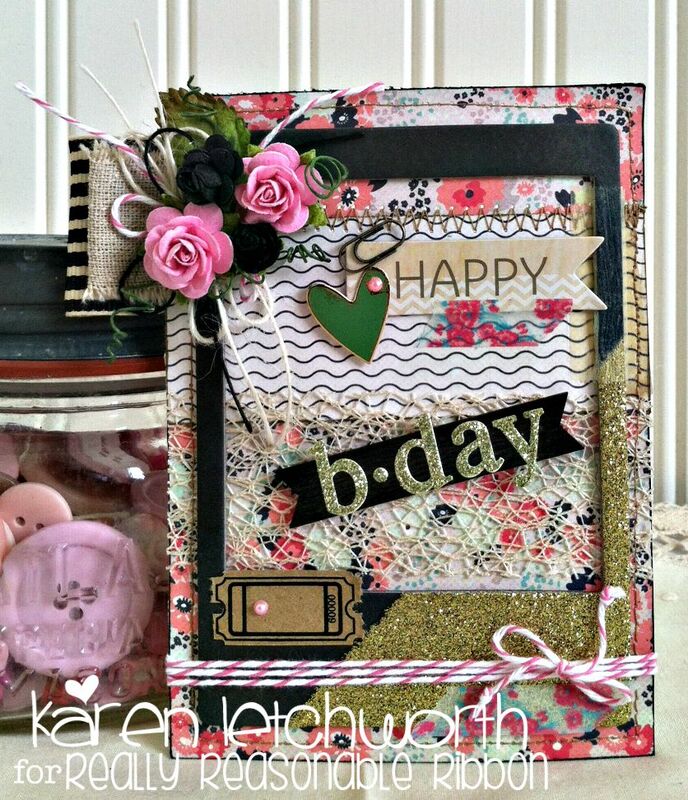 The pretty flower and ribbon cluster on the upper left-hand side of my card was created by using some of the gorgeous Wild Orchid Crafts Open Roses including the Black Open Roses and Pink Open Roses. I also included a 30 mm Mulberry Paper Leaf. They come in many lovely colors, and each one compliments the next so nicely. The bigger ribbons (on the side) include some wide May Arts Ribbon and some 2 1/2" Cotton Blend Plain Ribbon. I used them to create a little "tab". I also incorporated some Ivory Burlap String, Black Burlap String, and some sweet Raspberry Baker's Twine. Across the background of my card (under the sentiments), I placed a length of the 1.5" Champagne Netting which gives the card such an awesome texture. I also tied several lengths of the same Raspberry Baker's Twine around the bottom of my card, and into a knotted bow. So you see.....Really Reasonable Ribbon really makes it easy to create a super special Birthday card for all the amazing people in YOUR life who deserve something that expresses just how special they are to you. Why not treat yourself today? We also hope that you will play along in our Current Challenge, and I warmly invite you to visit my blog, My Cup Runneth Over, to say hello. Happy crafting!